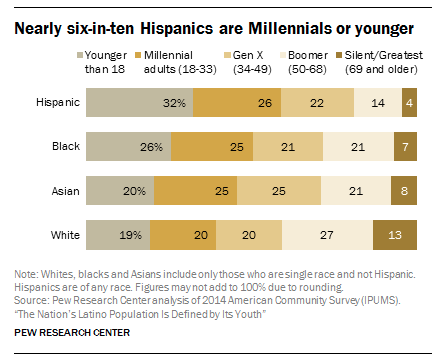 The Hispanic community in the United States is not only one of the most thriving groups experiencing considerable exponential growth, it is also a demographic with a diversity that makes it unique within the trend market. As "more than half of U.S.-born Latinos are under 18," Hispanics are "the youngest ethnic or racial group" in the country, according to the Pew Research Center. Among them, 14.6 million are Millennials (that is, young people between 18 and 33 years old in 2014). This demographic has attracted the attention of marketing and research specialists due to its marked tendencies, as well as the target the group represents in many aspects of cultural life in the country. For technology companies like Viant, focused on market growth, Millennials are one of the most intrinsically multicultural consumers in the United States," representing some 75 million individuals across the country. In its analysis of the demographic group, Viant showed that Hispanic consumers are not only more inclined to interact with brands directly through social media, but that 30 percent of them "are more likely to register as Democrats." Between Starbucks, Amazon and the Kardashians, the diversity of trends and interests of this group are broad enough to encompass politics, culture, and economics, but the most important features of Latino Millennials may surprise you. For example, NBC reported that "Latino Millennials are less likely to identify as heterosexual," and "more than one in five" identifies as part of the LGBTQ collective. Data recorded by the GenForward project of the University of Chicago determined that "approximately 14% of all Millennials identify as lesbian, gay, bisexual or transgender. When you break it down by ethnicity, however, Latino millennials were much more likely than other ethnic groups to self-identify as LGBTQ or non-straight." The organization's research work found that "22% of Latino Millennials identify as LGBTQ, compared to 14% of African Americans, 13% of whites and 9% of Asian Americans." Also, media outlets such as NPR have reported a growing trend in states like California where the Latino community "is embracing vegan food," especially in suburbs like Santa Ana, Ontario, Highland Park and Whittier. While "access to fresh and healthy foods is a problem for low-income Latino communities" with a significant risk of diabetes and other diseases directly related to food, veganism seems to be one of the first options for this demography. This trend seems to be directly related to the indigenous heritage in the Hispanic community. According to NPR, "there are no hard numbers on how many Mexican-Americans are vegans, but this way of eating isn’t so far off from what their ancestors ate in pre-Columbian times." "Before the conquest, most of Mexico’s indigenous natives followed a plant-based diet," NPR continued. "Beef, pork, chicken, lamb and goat, the mainstay meats of modern-day Mexican food, all came with the Spaniards." Finally, the new political conditions of the country - which have made the Latino a target of stigmatization - have prompted changes that had been brewing for years in the community. In 2013, Annette González-Malkin wrote in PR Week that the metamorphosis of the Millennial Latino identity was surfacing more and more within market trends. Aspects such as native bilingualism and adaptation to American culture (something that the columnist defines as "speak English, act Latino"), allowed a wide range of scope for such a heterogeneous community. And in politics, this process of redefining identity has become palpable, especially during this year’s primary elections. Cases like that of Alexandria Ocasio-Cortez have shown that the Latino not only looks for someone to represent him, but has decided to reformulate the political platforms ("Democrat," "Socialist," "Progressive") and adapt them to his fundamental needs, instead of waiting for the political establishment to decide to recognize him once and for all as the social force that he is a part of.